Fourth year is an intense time for most people: senioritis kicks in, graduation fears emerge, and the never ending question of "what are you doing after school?" is asked by every single person you meet. For the most part, I've avoided answering that question, sweeping it away by responding, "Oh, well, I'm waiting to hear back from a few places, and then I'll see." I've heard back from those places, which is great, but now I actually have a decision to make. A choice. I have to pick an answer for "What are you doing next year?"... The choice, for me, is an easy one to make. But when I factor in the opinions of parents, professors, friends, acquaintances, etc, it becomes a little more difficult. So, let's weigh my options, two to be exact. I don't want to sound braggy or self-entitled or annoying, but just honest. I did not expect to get into this program at all. I spent maybe an hour on my application, submitted an old essay for a writing sample, and asked for references at the very last minute. I applied to make my parents happy, and as a second choice if I didn't get into my dream program. I completely agree with the above photo. 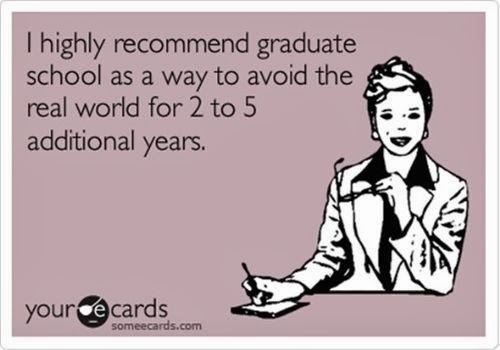 If you don't know what you want to do as a career, a Master's Degree is a great option. If you're pursuing a PhD afterwords, a Master's is a great option. If you will get paid more money or will be working in an industry that is impressed with more schooling, a Master's is a great option. For me, none of the above reasons apply. I know what I want to pursue, I am anxious to get out into the working world, and I see pursuing a Master's Degree as a waste of my time and my money. Yup, I'm planning on selling my soul to Advertising. I love writing, I love creativity and design, and I'm not going to lie, I'd love to make really good money. This program is the only one of its kind in Canada. You spend two semesters learning hands-on skills that can actually be used in the real world. You develop a portfolio, you gain connections, and you even get an internship at an agency as part of the program. The complete opposite of theoretical and academic knowledge, this program is all about real life applications and the intention that you will have a job career once you're out of there. The path for me is clear, even though my parents don't see it that way. They come from a time when "University Education" was elevated to the most prestigious thing one could achieve in life. College sounds like a dirty word, a place where "uneducated" people go to do "unimportant" things. 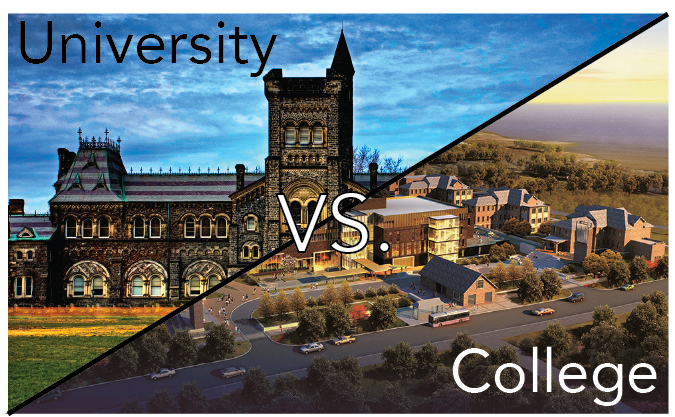 I know the stereotypes of University vs. College are slowly dissipating as students struggle to find real life applications after a four year undergrad in English/Psychology/History/whatever. I know that University can be for some people - albeit a small percentage - but it's not for me. So how do I convince my parents that the choice they want is not the choice that I want?